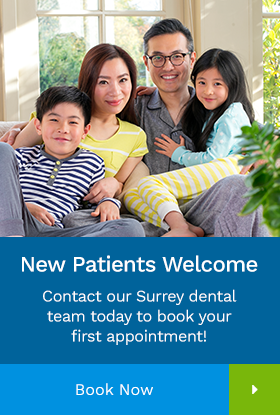 At Elgin Corners Dental in Surrey, we offer a variety of services for the diagnosis, treatment and prevention of periodontal (gum) disease. Periodontal (gum) disease is a common inflammatory condition which affects the supporting and surrounding soft tissues of the tooth; also the jawbone itself when in its most advanced stages. A bacterial infection affects the gums when the toxins contained in plaque begin to irritate and inflame the gum tissues. Once this bacterial infection colonizes in the gum pockets between the teeth, it becomes much more difficult to remove and treat. Periodontal disease is a progressive condition that eventually leads to the destruction of the connective tissue and jawbone. If left untreated, it can lead to shifting teeth, loose teeth and eventually tooth loss. A combination of excellent home care and professional dental care will ensure and preserve the natural dentition and supporting bony structures. When bacteria and calculus (tartar) are not removed, the gums and bone around the teeth become affected by bacteria toxins and can cause gingivitis or periodontitis, which can lead to tooth loss. Despite practicing rigorous oral hygiene routines, as much as 30% of the population may have a strong genetic predisposition to gum disease. These individuals are six times more likely to develop periodontal disease than individuals with no genetic predisposition. Bleeding when brushing, flossing or eating food is one of the most common symptoms of a periodontal infection. The toxins in plaque cause a bacterial infection which makes the tissues prone to bleeding. A periodontal infection may be present if the gums are swollen, red or painful for no apparent reason. It is essential to halt the progression of the infection before the gum tissue and jaw bone have been affected. It is also critical to treat the infection before it is carried into the bloodstream to other areas of the body. Although breath odor can originate from back of the tongue, the lungs and stomach, from the food we consume, or from tobacco use, bad breath may be caused by old food particles which sit between the teeth and underneath the gumline. The deeper gum pockets are able to house more debris and bacteria, causing a foul odor. A sign of rapidly progressing periodontitis is the loosening or shifting of the teeth in the affected area. As the bone tissue gets destroyed, teeth that were once firmly attached to the jawbone become loose or may shift in position. Pus oozing from between the teeth is a definitive sign that a periodontal infection is in progress. The pus is a result of the body trying to fight the bacterial infection.